Sanaz Berahmani graduated 2017 March 27th, after which she left the ORL. Click her LinkedIn tag. To Thesis: Press-Fit Stability of Cementless Femoral Knee Implants. A Biomechanical Evaluation. In 2004, after obtaining the rank of 800 amongst 400,000 students in a university entrance exam of Iran, I started my bachelor study in Biomedical Engineering in the Tehran Polytechnic University, with a specialty in the field of Biomechanics. After my graduation, I worked for two years as a sales engineer. 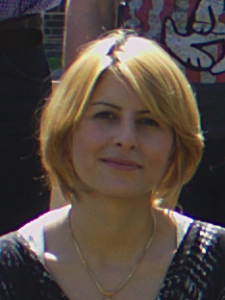 In 2010 I came to the Netherlands to further my study in Biomedical Sciences at the Radboud University. Since my main interest was biomechanics, I continued my master study in the field of Clinical Human Movement Sciences. I spent about one year in the Orthopedic Research Laboratory as an intern which inspired me to stay in the same research field. My internship project titles were the micromechanical variation along the axial axis of a retrieved cemented hip reconstruction (Supervisor: Dr.Ir. 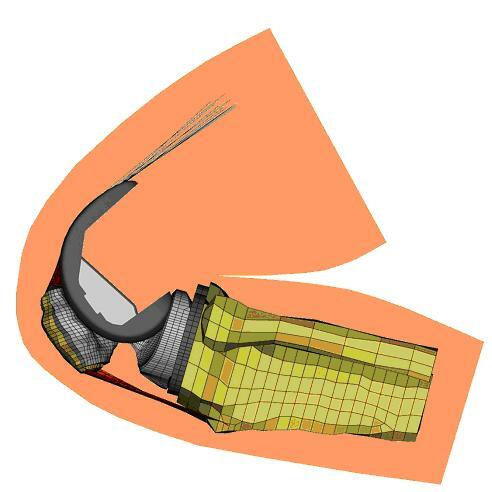 Daan Waanders) and a Finite Element Analysis to investigate the effective factors on the primary stability of cementless femoral knee implants (Supervisor: Prof. Dr. Ir. Nico Verdonschot). Total Knee Arthroplasty (TKA) is a well-known treatment method in case of osteoarthritis and cartilage damage. To investigate different aspects of TKA, we have been developing a 3-D model of TKA, which is capable to investigate several parameters during dynamic movement of the implanted knee. 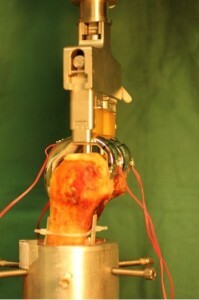 The current model is dedicated for a cemented version of TKA. During my Phd project, the goal is to develop this model for a cementless version of TKA. In the cementless TKA, fixation between bone and implant is provided by press-fit and frictional forces instead of using Polymethylmethcrylate (PMMA). 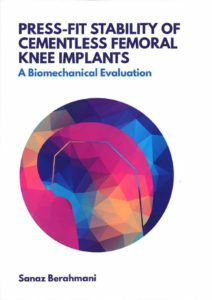 To develop a realistic cementless model, first the effective parameters on the fixation strength of the implant should be determined. For this puprose, several Finite Element (FE) studies and cadaveric experiments were performed to investigate the different factors which include coating surface, press-fit force, bone material properties and implant design. 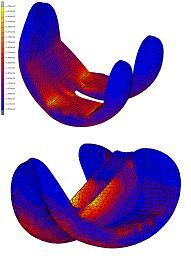 The final goal is to measure micromotion in a realistic Finite Element Model using valid parameters.